Another genre that you never have to think of your own plot idea for again. You can thank me later. As pointed out in previous comments, there are virtual dice available online if you don’t happen to have the right polyhedrons just lying around. This said, I have faith in the essential geekiness of my audience. Enjoy, and don’t forget to share your results. Hello. It’s been too long. 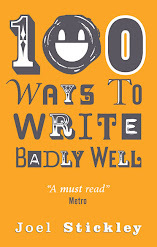 A How To Write Badly Well book has now been put together and is with the publisher. I will, of course, keep you updated. In the meantime, I thought we could try something a bit different. Use it wisely and please feel free to post your results in the comments section below.